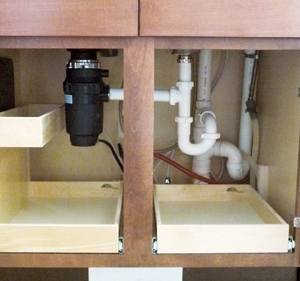 While plumbing obstacles would seem to preclude the installation of slide-outs, we often install slide-outs under sinks of all kinds. Sometimes we discover the plumbing was installed so cleanly there are few obstacles to worry about. 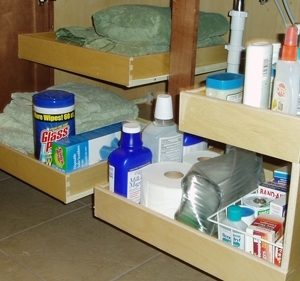 In these cases, one of our basic slide-outs is all that you need. 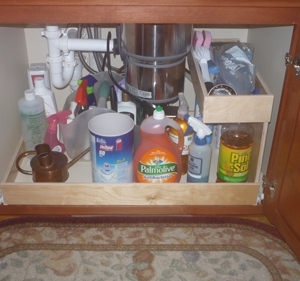 In cases where the plumbing is not clean we have other options. 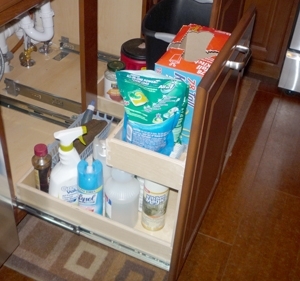 We can simply “short the drawer;” that is, make a slide-out that isn’t as deep as the cabinet, therefore avoiding the obstacle. If that won’t work we can make 6 and 8 sided slide-outs (notched) to avoid plumbing. Of course, there are times when nothing we can offer is feasible, either practically or economically. When that’s the case, we’ll surely tell you. 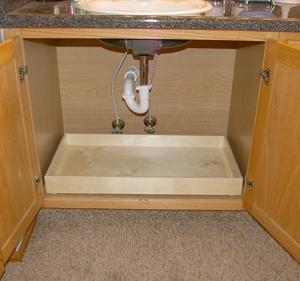 We’ve collected lots of pictures of under sink applications over the years. The abbreviated collection below will give you some ideas as to what’s in the realm of possibility, though your particular plumbing configuration will dictate what can or can’t be done. Below the pictures you’ll find detailed information about the materials and construction we use, available customizations, information about installation, and of course, our price list. Under sink slide-out pricing is based on our basic slide-out price list with the following up-charges. To determine the correct price, just assume a basic slide-out for the space in question and price it accordingly. Shorted slide-outs: basic slide-out price. There are no up-charges for shorted slide-outs. 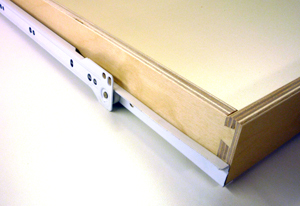 The main drawer box of all of our slide-outs is constructed of 1/2″ Baltic birch–an imported hardwood ply. 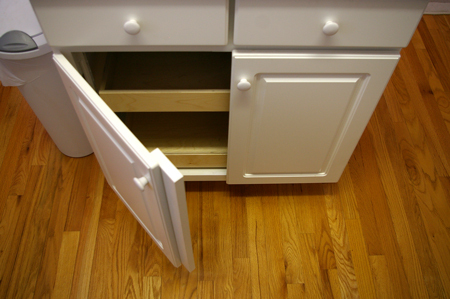 Designed specifically for the drawer box industry, this material is very strong, exceptionally stable, and sports a very attractive grain pattern. 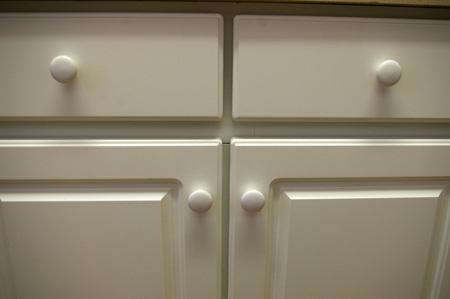 We leave the color natural and apply two coats of clear lacquer to protect it. 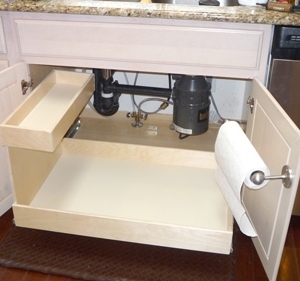 There is no better way to make a long lasting drawer box than using dovetail joinery. 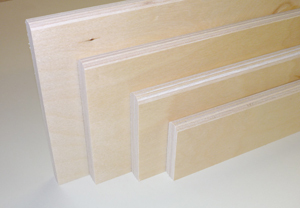 While our competitors either avoid them altogether, or charge a premium for them, all of our slide-out products employ dovetail joints, insuring a lifetime of service. A stapled on bottom just won’t do! 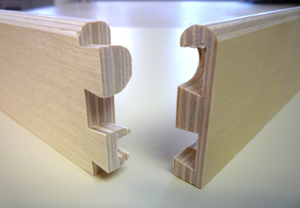 To insure your slide-outs never fail, we channel every side with a 1/4″ dado to completely capture and support the bottom. 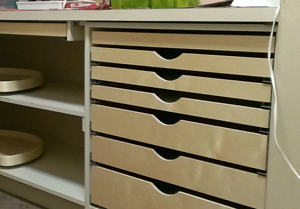 Our drawer bottoms are made of 1/4″ MDF with a thermally fused melamine finish in almond color. 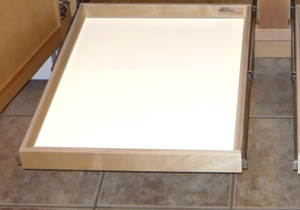 Our standard drawer slide is 3/4 extension (does not extend all the way the cabinet frame), white epoxy coated, and rated at 100lbs (though we recommend no more than 50lbs). 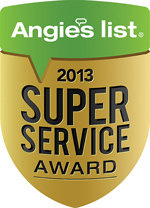 We also offer a heavy duty, full extension slide–see Customizations and Upgrades below. 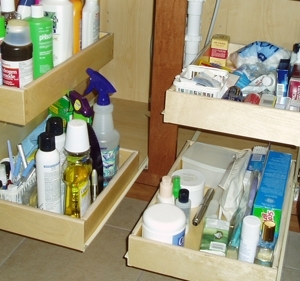 Our upgraded full extension slides allow for easier access to the items at the very back of the drawer while also supporting twice the weight. Our full-extension slide is a side mounted, all steel ball bearing slide that’s rated 100lbs (we recommend 80lbs or less). 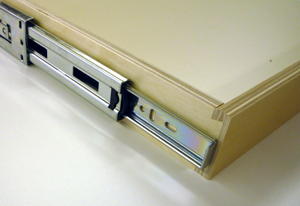 You can easily adjust the height level of your slide-outs with custom pilasters. 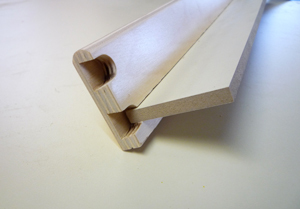 Our pilasters are made of poplar and are pre-drilled every 1 1/4 inch. 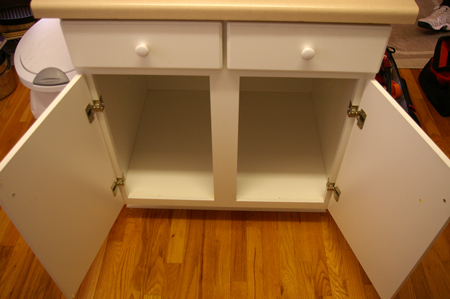 Pilasters are available for both single and double door cabinets in standard height (for base cabinets), or tall (for pantry cabinets). While not essential in most applications, finger scoops can be super handy when stacking slide-outs close together. 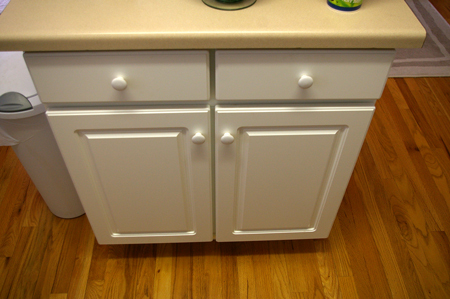 If you would prefer white drawer bottoms as opposed to almond, they’re available upon request at no additional charge. 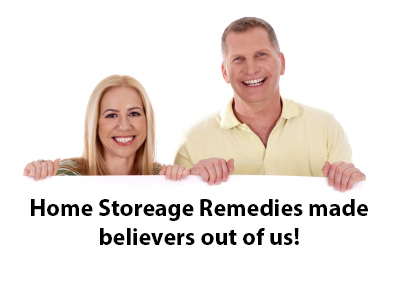 In many cases, we can remove the center partition between the doors in order to install full width slide-outs. Once removed, the partition is attached to one of the doors. As you can see in the pictures, the only visible evidence is the tiny gap both above and below the partition. We do charge for this service, but it usually costs less to do it and add just two slide-outs than it would to install four narrower ones. 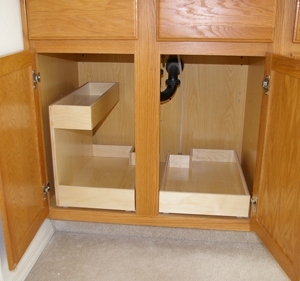 NOTE: Once we remove the center partition, installing the slide-outs will require adjustable pilasters (see below). Pilasters are essentially pre-drilled posts made of poplar that are installed against the inner side walls of the cabinet. 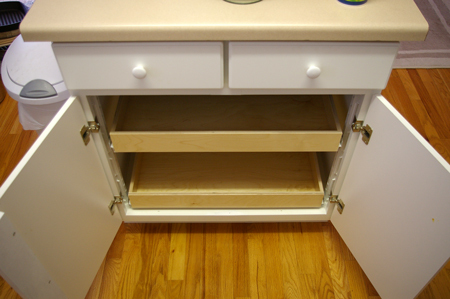 The drawer slides are then attached to the pilasters. 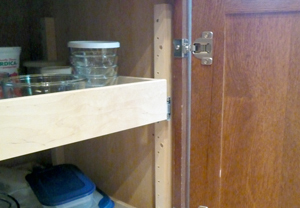 Because the pilasters are pre-drilled, relocating the slide-out shelf is just a matter of moving the slides up or down to the desired location. 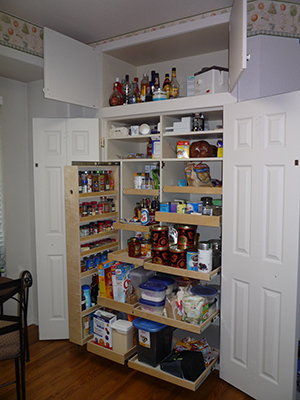 Our custom pilasters are sold in sets for both single and double door cabinets, and are available in standard length (for base cabinets) and tall (for pantry cabinets). 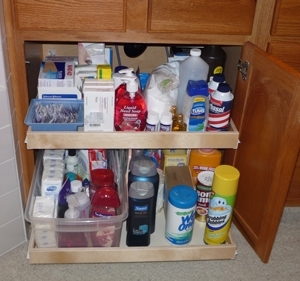 Most slide-out shelves are installed in the same way your existing cabinet drawers are–the front of the drawer slide is mounted to the cabinet’s face frame and the rear is mounted to the back wall with special brackets. Slide-outs installed this way are not adjustable, though we are happy the set the upper slide-out(s) at a level that you specify.